Today at New York Comic Con, Starz premiered episode 301 of original series Ash Vs. Evil Dead to a crowd of 2,200 at the Hammerstein Ballroom. "Family," written by showrunner Mark Verheiden and directed by Mark Beesley finds that Ash has gone from zero to hero in Elk Grove! With evil defeated and humanity saved, there was only one thing left to do: open a hardware store. His peace is short lived when evil returns with a new target close to his heart. The surprise screening was followed by the previously announced Ash vs Evil Dead panel, moderated by Entertainment Editor, Terri Schwartz. Panelists included: Bruce Campbell (executive producer, star), Ray Santiago (Pablo Simon Bolivar), Dana DeLorenzo (Kelly Maxwell), along with newcomers Arielle Carver-O'Neill (Brandy Barr) and Lindsay Farris (Dalton - a Knight of Sumeria). Ash vs Evil Dead Season 3 will premiere on Sunday, February 25, 2018 at 9PM ET/PT. 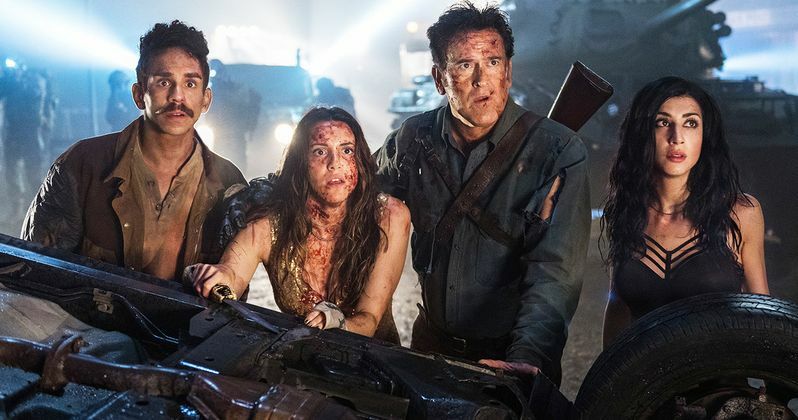 Starz also released three new images from Ash vs Evil Dead Season Three featuring a variety of scenes from the new season including Lucy Lawless as Ruby in a new look, Arielle Carver-O'Neill as Brandy Barr, Ash's long lost daughter, as well as a group shot with Ray Santiago (Pablo) and Dana DeLorenzo (Kelly). The third season finds Ash, having gone from murderous urban legend to humanity-saving hometown hero, discovering that he has a long lost daughter who's been entrusted in his care. When Kelly witnesses a televised massacre with Ruby's fingerprints all over it, she returns with a new friend to warn Ash and Pablo that evil isn't done with them yet. Blood is thicker than water in the battle of good vs Evil Dead. Bruce Campbell (The Evil Dead, Burn Notice) leads the cast, reprising the role of Ash Williams; Lucy Lawless (Salem, Spartacus) as Ruby, devises her most diabolical plan to defeat Ash and raise hell on earth; Ray Santiago (Touch, Meet the Fockers) as Pablo Simon Bolivar, forever loyal to Jefe (Ash) will realize his true destiny in the battle against evil; and Dana DeLorenzo (A Very Harold & Kumar 3D Christmas) as Kelly Maxwell, whose single goal is to kill Ruby and end the Evil Dead torment once and for all. New to the cast for season three are Arielle Carver-O'Neill (House Husbands) as Brandy Barr, Ash's long lost daughter left in his care when her mother meets an untimely demise; Lindsay Farris (Home and Away, Primal) as Dalton, leader of an ancient order called the Knights of Sumeria, who seek Ash to lead their fight against The Dark Ones. Lee Majors (The Six Million Dollar Man) returns as Brock Williams to warn Ash from beyond the grave. Sam Raimi serves as Executive Producer with Rob Tapert (Evil Dead, Spartacus, Xena: Warrior Princess), Bruce Campbell (Evil Dead, Burn Notice), Ivan Raimi (Drag Me To Hell, Spider-Man 3) and Rick Jacobson (Spartacus). Mark Verheiden (Battlestar Galactica, Daredevil) serves as Executive Producer / Showrunner. Ian Williams (Power) serves as Co-Producer and Moira Grant (Spartacus) serves as Producer for https://www.starz.com/|Starz.